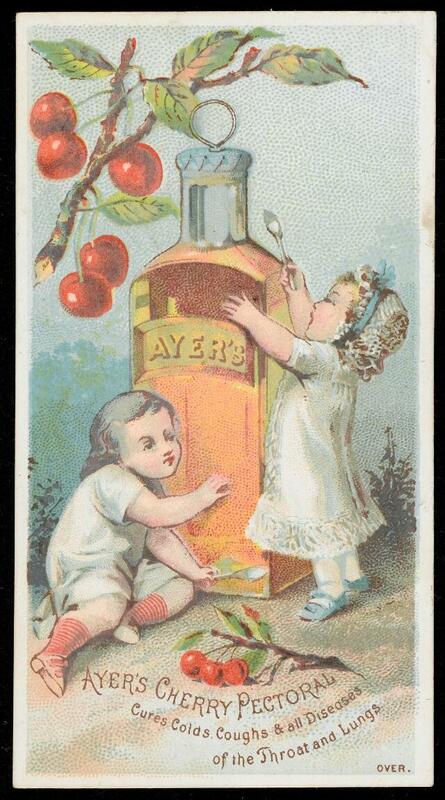 Colour card showing two babies reaching to a massive bottle of the medicine, spoons in hand. Both are wearing white gowns. One has red socks, one has blue shoes. There is a branch of cherries in the foreground and in the air above the bottle. The medicine is supposed to rapidly cure "colds, coughs, sore throat, influenza, laryngitis, quinsy, hoarseness, croup, bronchitis, asthma and catarrh" and provides relief from whooping cough and consumption..